A school in Greater Manchester has banned its pupils from wearing knotted ties because it says they could pose a safety risk. Clip-on ties, like those worn by police officers, are regulation uniform at Bramhall High School in Stockport. Head teacher John Peckham said the ties looked smarter on pupils, as well as preventing potential accidents. The Campaign for Real Education said the school's decision was "health and safety gone mad". Bramhall High's uniform shop has been selling clip-on ties for more than a year to phase in the new rules. Mr Peckham said: "Obviously there is a health and safety element. "Pupils can take precautions during technical lessons where there is machinery, but it is the unexpected factors such as running and having their ties pulled that could be a problem. "We also feel it is smarter because older children will not wear the ties in a casual way. This is in line with places like Marks and Spencer, the police and the armed forces." 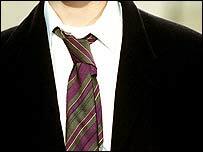 The tie rule will be strictly enforced from September with loose tie offenders sent home. Stockport Council said the decision was taken by the school. Nick Seaton, chairman of the Campaign for Real Education, said the decision was inexplicable. "It seems like another instance of political correctness and health and safety gone mad. "Children have worn school ties for decades and I have never heard of an accident in all that time."